Property tax records are public information. If you visit the property tax assessor's office for your county or find the website online, you can look up tax information by address. Learning the quirks of a given website should be the biggest challenge you'll face. Simply typing the name of the county plus "property tax records" into a search engine should give you the right website to visit. Any instructions you need for your search should be on the webpage. Click through to the page that offers a property record search, and enter the address. Be careful to observe the website's particular rules. The Cook County Assessor's Office in Illinois, for instance, says not to abbreviate Street, Place or Avenue when entering a street name. North Carolina's Durham County's property website is fine with abbreviations. You may be able to find information on real-estate websites such as Zillow by typing in the address. However, Zillow's primary purpose is to provide valuation estimates for home sellers and buyers. To get exact official figures, you're better off checking the official records. Once the address search returns the property, look for the property tax figures. Different counties lay out the search results differently. If it's not immediately obvious, keep looking, but it's possible the tax figures you want won't be available. The county may have only the last two or three years data on the website. Further, if you want to check that your latest payment went through, it may not be posted immediately. If you can't find the data you want through the county website, visit the county courthouse. You're entitled to access the property tax records there, as well as online. However you will be stuck with confining your research to county business hours. Other tax jurisdictions may have information about the most recent sale, the allowed land uses and a description of the buildings on the land. Several tax assessment websites include warnings that the county doesn't guarantee accuracy. For example, Durham County states that you should consult the official written records rather than the website if you have to be absolutely certain of your data. Cass County, North Dakota, points out that assessments can be challenged or changed even after they're posted. Several sites state that the assessment records shouldn't be taken as official legal descriptions of a property. A legal description is one that identifies the exact boundaries of the parcel. When the property changes hands, the legal description identifies exactly what land is being bought and sold. The tax assessor needs enough identifying data only to tax the property. Cass County, for example, includes the disclaimer that the legal description on its website may be shorter than it would be on a property deed. A Durham, NC resident, Fraser has written about law, starting a business, balancing your budget and fighting evictions, among other legal and financial topics. Sherman, Fraser. "How to Find Property Taxes By Address." 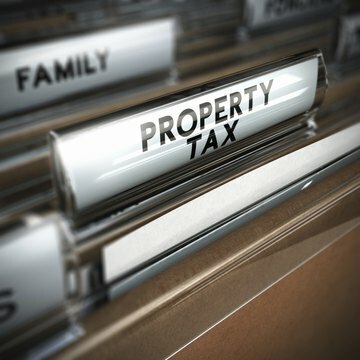 , https://legalbeagle.com/5638547-property-taxes-address.html. 11 March 2019.